New York, NY : Scholastic Inc., 2014, c2013. 79 p. col. ill. 21 cm. It&apos;s time to wire up and get connected to one of the most complex areas of Minecraft--Redstone. Redstone experts guide you through all aspects of working with Redstone including mining, smelting, using repeaters, circuit components and circuit designs. This handbook also includes exclusive tips from game creator Notch himself and some of the most extraordinary Redstone creations ever made. So power up and get switched on to Redstone--it&apos;s electrifying --Provided by publisher. 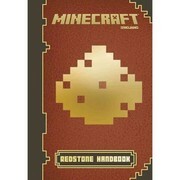 The Minecraft Redstone Handbook is one of the most useful handbooks that I have read so far. It includes tips and tricks, traps and some of the best and most complicated redstone builds of all time. By the time you&apos;re done with this handbook you&apos;ll want to build everything in the minecraft universe!